Q: Can consumers order from TheBestCardCompany.com website? A: Yes! This is a retail site for The Best Note Cards, which are available for consumers to purchase both here and on Amazon.com by clicking here. Q: I'm a wholesaler. Can I purchase your cards for resale? A: Yes! When registering for your account, please select Wholesale Customer-pending approval as your Type of Account. 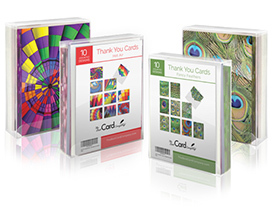 Once your account is approved, you will be able to purchase cards at wholesale prices. Q: What is the wholesale minimum order, and what are the ordering/reordering terms? A: Our everyday minimum order is $100, with a minimum of four packs per design. Opening note card orders must be prepaid by check or credit card (Visa/MasterCard/Discover). Thereafter, we offer Net 30-day terms, and the minimum reorder is also $100. All sales are final. Q: How are the note cards packaged? A: The note cards come in sets of 10 cards with 12 white envelopes, and will be packaged in a clear PVC box. An additional 11th card visible from the back of the box displays a cluster of all 10 images contained within that set. The second panel of this additional card features a complimentary, cut-and-mail postcard as an added bonus. Q: What are the specs of The Best Note Cards? A: Each note card measures 5.125" x 4" and comes with an elegant, plain white envelope. Q: Are the note cards environmentally friendly? A: Yes, all of our note cards are printed on recycled paper, on-demand, here in the USA. Q: How can I get a wholesale catalog? A: For environmental reasons, we are not printing paper catalogs. Please use this website to view our most current selection of designs. Q: Do you offer merchandisers to display The Best Note Cards? A: The Best Card Company is headquartered in Union City, New Jersey. The Best Note Cards are shipped from New Jersey via UPS. Our hours of operation are 10 a.m. to 5 p.m., Monday through Thursday. It is best to email us at BestInfo@TheBestCardCompany.com; but you may also call us at 800.957.8233. We promise to make every attempt to get back to you within 24 hours on business days. Q: Do you sell to Canada and other countries? A: We can ship anywhere that UPS delivers.